Where is Porsche at home? In the hearts of sports car drivers. And, of course, on the road. This is where life happens for purists. Those who are looking for sheer, unadulterated driving pleasure. People who not only want to experience sporting spirit, but also wish to demonstrate it themselves.Closer contact with the road is something we’ve always aspired to. Our philosophy of Intelligent Performance takes us even nearer to this goal. 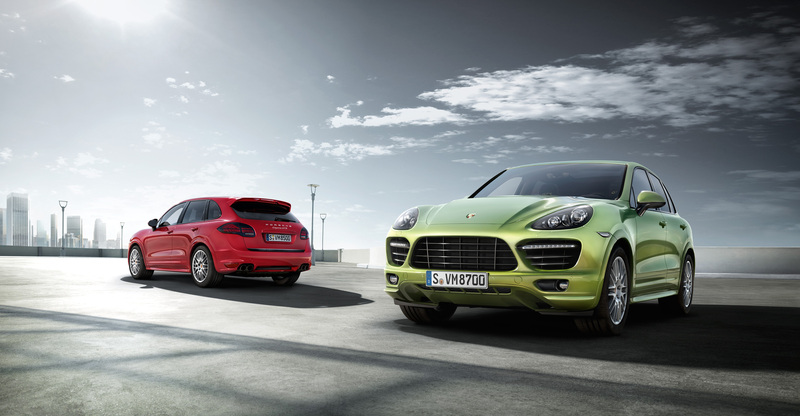 The 2012 Porsche Cayenne GTS is equipped as standard with the SportDesign package. The athletic lower front and rear fascia elements, dynamic side skirts, wheel arch extensions and rear spoiler with fixed bi-plane design are all finished in exterior color. All components have been optimized in the Porsche wind tunnel to improve their efficiency and further enhance the vehicle’s purposeful stance. 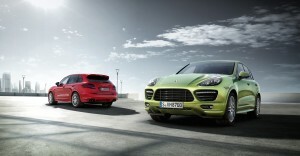 The 2012 Porsche Cayenne GTS is available in two exclusive special colors: Carmine Red or Peridot Metallic. A range of other colors is naturally available on request. For contrast, the side window surrounds have a black high-gloss finish. Other features include the Bi-Xenon(TM) main headlights with black surround and the tinted LED taillights. The standard sport exhaust system delivers an even more distinctive sound. For the looks to match, it features twin tailpipes with matte black finish. 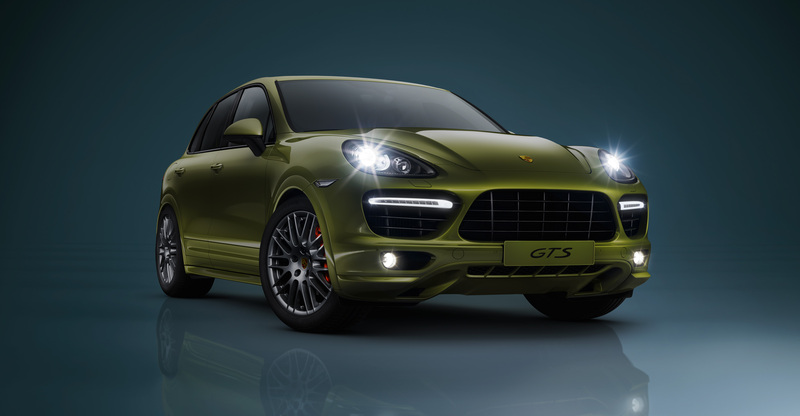 The 2012 Porsche Cayenne GTS features Bi-Xenon(TM) main headlights with black surround and Porsche Dynamic Light System (PDLS). The dynamic cornering light function swivels the main headlights towards the inside of a corner based on the current steering angle and road speed, while the static cornering lights activate the auxiliary headlights in order to illuminate more of the road in tight corners and turns. PDLS also features speed-sensitive headlight control and an adverse weather function, which is activated in conjunction with the rear foglights. The result: even greater safety, not just at night and during cornering. 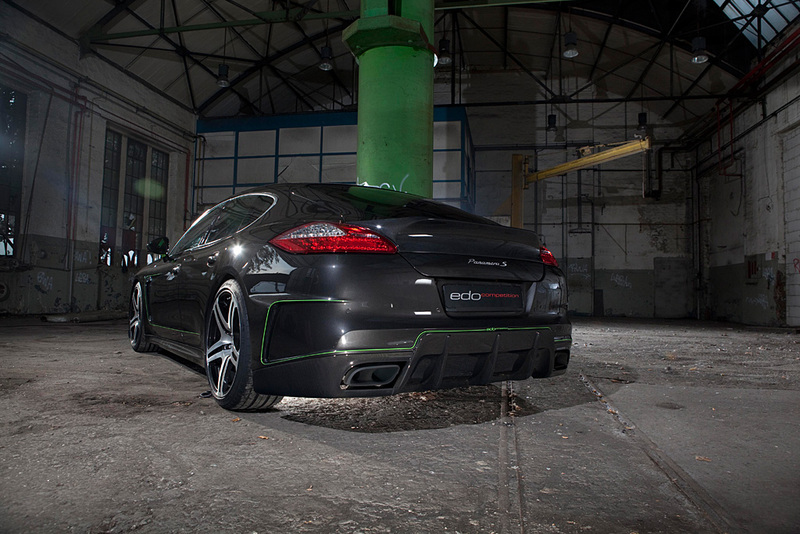 LED technology is used for all functions of the dark-tinted tail lights. For an ultra-fast response and greater luminance. The uprated, naturally aspirated 4.8-liter V8 engine delivers 420 hp at 6,500 rpm. Maximum torque of 380 lb.-ft. is available at 3,500 rpm. The benchmark sprint from 0 to 60 mph is completed in just 5.4 seconds. Top track speed comes in at 162 mph. 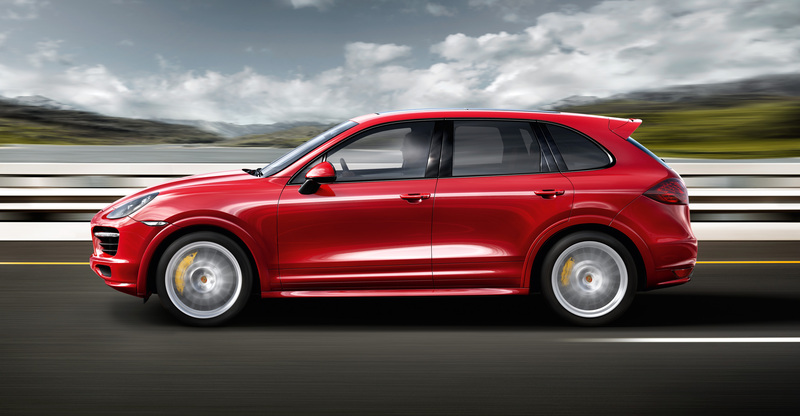 The engine power of the 2012 Porsche Cayenne GTS is 20 hp higher and boasts an added 11 lb-ft. of torque compared to the Cayenne S. A shorter drive ratio further enhances the car’s agility. Drive is transmitted to the road with smoothness and precision by the standard eight-speed Tiptronic S transmission. Depending on road conditions and driving style, it automatically selects the correct driving mode. You can change gear using two gearshift paddles on the standard SportDesign steering wheel. One pull on the right-hand paddle and Tiptronic S shifts up. One pull on the lefthand paddle and Tiptronic S shifts down. The optional Sport Chrono Package* includes an analog and digital timer located at the center of the dashboard. 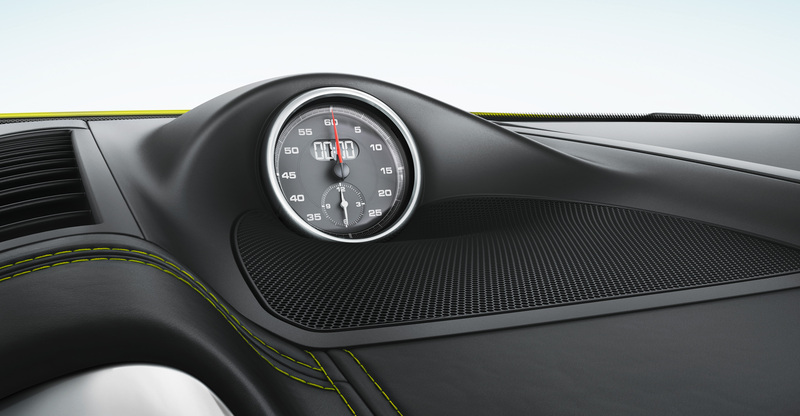 The performance display in Porsche Communication Management (PCM) informs you about the total driving time, lap distance covered so far, the number of laps completed and individual lap times. * Only in conjunction with Porsche Communication Management (PCM). 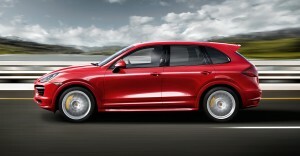 The 2012 Porsche Cayenne GTS is equipped with Air Suspension that sits 20mm lower as standard. This allows for a lower center of gravity and even closer contact with the road. The standard PASM is an electronic damping adjustment system that actively and continuously regulates the damping force depending on the current road conditions and driving style. During performance driving with heavy acceleration and braking phases, there is a natural increase in body and suspension movement. PASM intervenes to reduce this effect. It has three driver-selectable modes whose basic setup is performance-oriented to match the capability of the Porsche Cayenne GTS: ‘Comfort’, ‘Normal’ and ‘Sport’. Sensors monitor the movement of the body and also gather data on lateral acceleration, steering angle, brake pressure and engine torque. Based on the driving conditions, the system continuously varies the individual damping forces within the parameters defined for the selected mode. PASM remains active at all times. It automatically adapts to the prevailing driving situation, enabling greater car control and improving comfort and safety. 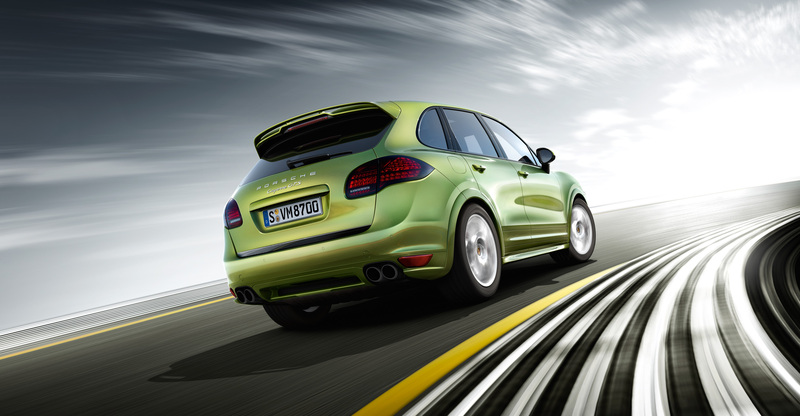 As standard, the 2012 Porsche Cayenne GTS is fitted with 20-inch RS Spyder Design wheels. These one-part alloy wheels feature a race-inspired look. The 2012 Porsche Cayenne GTS is fitted as standard with six-piston monobloc aluminum fixed calipers at the front and four-piston equivalents at the rear. It has internally vented discs all round, helping to ensure consistent brake performance during heavy use. The discs have a diameter of 360 mm at the front and 330 mm at the rear and the calipers feature a red paint finish. Available as an option, the Porsche Ceramic Composite Brake (PCCB) offers race-proven brake performance. 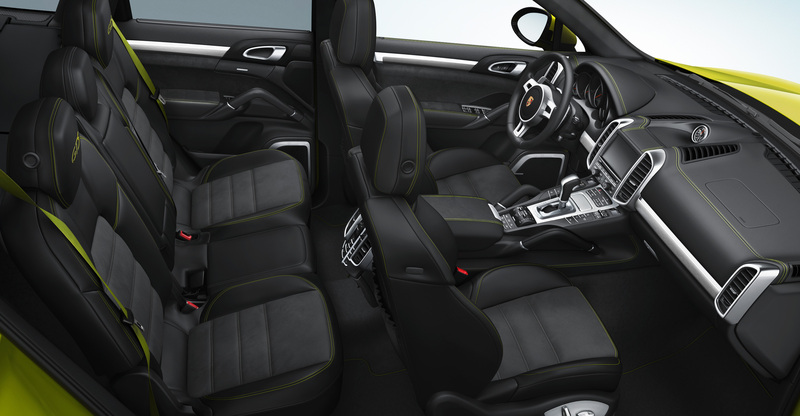 The 2012 Porsche Cayenne GTS sports seats with 8-way adjustment are highly dynamic thanks to their low positioning. With adjustable fore/aft, height and cushion/backrest angle settings, they also offer exceptional comfort and support – even during performance driving. It holds true to a rich racing heritage. All the door panels, armrests, seat centers and rooflining are finished in Alcantara(R) as standard. Used extensively in race car driving. The optional GTS interior packages* in Carmine Red or Peridot give you the opportunity to add stunning highlights to the inside of your car. These include an embroidered ‘GTS’ logo on the head restraints on the front and outer rear seats. There’s also a choice of further elements such as front and outer rear seat belts and decorative seams on the dashboard, upper door panels and armrests in contrasting color. * Only in conjunction with Black leather interior and GTS sports seats.